But first, the good- Jamel Turner has stabilized. The WR corps just got thinner; Duron Carter is transferring to Coffeyville Community College to get his grades in order. He will have three years of eligibility remaining once his time there is completed. Defensive End Keith Wells is leaving the program. No solid information as to the why or where, just lots of speculation that we won’t get into here. Man, I was excited about this kid- especially after his work during the Spring Game. 2010 RB Rod Smith has not yet joined his classmates at Ohio State. Again, only rumors about the what and where; we’ll keep you updated. All that on top of the speculation that Jermil Martin may also transfer. Ok, silver lining…. breathe… More scholarships will be available for an amazing 2011 class. Hopefully, better news next time we do this. Today we found out: The Buckeyes will be without the services of Duron Carter for the Rose Bowl. The status of Rob Rose is still to be determined. Update- Rose is cleared for the game. For Rose, it would have meant that he had played his last game in the scarlet and gray. For Duron, it means he gets to have “that talk” with his dad. You may be saying- “Wait, didn’t I know this earlier?” Well, sure, but now that we’ve moved up to the big leagues it’s important that we wait for confirmation before climbing up on any ledges. Both players will be missed, and I’m sure that the opportunity to play in “the Grand-daddy” will be an immeasurable learning moment for each of the student athletes involved. While it’s never good timing for these types of matters, having players suspended before a bowl game is unfortunate for the rest of the members of the team as well. Again, everything is an educational opportunity. Each year, roughly 2,500 Division I football players leave college because they have exhausted their athletic eligibility, or are leaving early, or have graduated. Each year, about 200 rookie players make NFL rosters. Thus, more than 90 percent of Division I football players never play a down in the NFL. Take into account that some of the NFL rookies are Division II, Division III or NAIA players, and it’s closer to 95 percent. Watch any top college football team — the players are fast, muscular, and obviously devote tremendous amounts of time and energy to football. Ninety-five percent of them won’t play in the NFL. If they don’t study and don’t go to class, they walk away from college football practically empty-handed. Ohio State won the 2002 crown, and produced 11 players who were in the NFL for five years or more, 16 who played two to four years, and seven who played for one season. Again, this was the year’s best college football team, and almost two-thirds of its players never played an NFL down. Easterbrook feels, as do I, that University experience is about learning. As such student athletes need to make the most of all the opportunities given them in the classroom, in the WHAC, and in the ‘Shoe. It’s pretty obvious that Coach Tressel feels strongly about this as well (which is nice to see, given what we’ve heard about some places). But what’s important isn’t what I think or what Coach thinks- it’s what the two gentlemen wearing number 9 take away from this moment. I skipped a position update last week because there was absolutely nothing to take away from the Purdue game in week 7, particularly on the offensive side of the ball. After the Minnesota game last week things are looking up, but I would like to see similar results in more adverse situations before I can say that I have a lot of confidence in the offense. That being said, this week is basically a scrimmage before our trip to Happy Valley and a killer final three games of the season. So, it would be nice to see the offense pick a scheme and fine tune it. Even if the offense puts up big points this week, I am not sure how much you can take away from the performance due to the competition. At this point in the season, I am waiting for our dual with Penn State before I form any opinions. So, rather than focus on a specific position this week, I will briefly go over where we stand at every position on offense. Hopefully the entire offense steps up and uses this week as an opportunity to find some kind of identity to finish the year on a high note. Terrelle Pryor has put up decent numbers this year, but he has been painfully inconsistent. Purdue was an unbelievably awful game for Pryor, Minnesota was probably one of the best games of his career. Will Pryor build on his Minnesota performance against New Mexico State? We can only hope. The real test comes in two weeks. Would you want to tackle him? Neither did Minnesota. There are four backs listed on the depth chart heading into the game this weekend, mostly due to a series of injuries and questions about whether or not players will be healthy enough to play. Still, these four backs should provide the Bucks with a nice rotation for the rest of the season, and hopefully everyone will be back to 100% sooner rather than later. Many people were critical of Herron at the beginning of the year due to his subpar play. Unfortunately, he hasn’t had a chance to answer his critics since week 4 when he was injured against Illinois. It looks like Herron may play some snaps this week, but he will most likely be used sparingly to make sure he is 100% for Penn State. Ideally he will at least get a few carries this week in order to shake the rust off, because getting your feet wet for the first time in five weeks on the road against Penn State probably isn’t the greatest way to make a comeback. Unless something drastic happens in the next few weeks, it looks like it will be a disappointing year for Herron to say the least. Many people were pushing for Saine to be the starter even before Herron went down with his injury. Saine broke 100 yards in his first start against Indiana in week 5 but hasn’t come close to breaking 100 since. Still, Saine is averaging a respectable 5.3 yards per carry and his recent lack of production can be partially explained by a lack of opportunities. Saine only had 14 rush attempts against Wisconsin and 7 in the debacle at West Lafayette. Last week Saine carried the ball 11 times for 45 yards before being sidelined with a concussion. I looks like Saine will be available to play this weekend, but like Herron, his reps may be limited to make sure he is 100% for Penn State. Hall had 38 yards on 10 carries and his first TD of the year filling in for the injured Saine last week against Minnesota. That stat line has been about average for him when he gets into the game, and if the offense gets rolling against New Mexico State he will probably get a chance to carry the ball some more, but Hall may see some carries taken away by the emergence of Jermil Martin. Martin was definitely the breakout player of the week against Minnesota. His 75 yards and a TD on only 7 carries was probably the most impressive piece of running Buckeyes fans have seen this year. Despite his impressive running, I am not ready to call Martin the next big thing just yet. Keep in mind that he was carrying the ball against a Minnesota defense that was halfway on the bus by the time Martin got his first carry. So, I would take his performance with a grain of salt. Still, it was nice to see a back running with authority and breaking tackles like we haven’t seen since… well, Beanie last year. But anyways, I expect Martin to get more carries, and hopefully he can provide a power back look to hammer away at defenses up the middle and keep them honest on the edge. So good at catching the ball that he can carry it like this without fumbling apparently. Posey had by far his best game of the year last week, hauling in 8 passes for 161 yards and 2 TDs. Like Jermil Martin, however, you have to consider the competition before you get too excited. On the other hand, it definitely looked like Posey into developing into Pryor’s go-to guy, and that can’t hurt. Like everyone on offense, I will wait a few weeks before a make up my mind, but Posey definitely looks to be a solid #1 receiver in the making. Dane started off the year strong, but has been quiet for the past few weeks. You can’t exactly blame Dane considering the entire offense has been pretty quiet lately. If the offense is able to consistently move the ball, it is a pretty sure bet that Sanzenbacher will be involved. There’s not much to say about Ray Small, the talent is there, but the production has not been. Small did carry the ball 4 times against Minnesota, so the staff is trying to get him the ball. Unfortunately for Small, he is running out of time in his Buckeye career to be an impact player. Duron has all of the tools, but like everyone else on the offense, his numbers have been seriously cut into by the extremely inconsistent play of the entire offense. He is going to be good. It looks like another year where all of the preseason talk about getting the TEs getting involved in the passing game doesn’t actually materialize. Jake Ballard and Jake Stoneburner have combined for 10 catches and 118 yards on the year despite both playing in all 8 games up to this point. It once again is a case of poor production from the entire offense rather than poor play from the TEs in my opinion. If the offense gets rolling I imagine that the TEs will see a few more balls coming their way. So there you have it. Inconsistency has hurt everyone on the offense in terms of production so far this year. It would be nice if we could fix that in the last couple games. I will believe it when I see it. Pryor to continue improvement – He showed drastic improvement from the USC game to the Toledo game, and that pattern needs to continue. I only saw four plays last week that I said “what are you THINKING”….cut that to two, and I’m happy. By the way, we did manage to stop them on their final 3rd down play…when they kneeled on the ball to end the game. Part Two – Competent officiating, please! Anybody wanna revisit this one??? Had the refs examined this one for even a split second, we get the ball on the 20 after that play, and Illinois doesn’t score their first TD. Yeah, it's ugly. But it's OUR ugly! Juice on his back- He’s a good QB, but he gets out of rhythm pretty easily. With our front four, we should be able to contain him and make him jumpy. It will also give us a read on how well we’ll do against more mobile folks we may see later in the season. More of the same- TP had a solid game last week and a good game against the Illini last year. More, please. Offensive line, you've been put "on notice"! Our line needs to move people off the ball – While there were many positives to be taken away from last weeks game, the fact that the line didn’t dominate one of the worst defenses they will face all season is one negative that was pretty glaring. This week we face an Illinois defense that just lost Martez Wilson (their best defender) for the year. Looking at the rest of their roster on defense, I don’t see any “stars” that the Buckeyes have to worry about. I really want to see improvement from the offensive line this week and I think that is going to be one of the biggest keys for the rest of the season. As an extra incentive for the line to do well, I will be re-evaluating them next week in my ongoing look at the various position groups. Limit making dumb decisions, Pryor – I mentioned that offensive line improvement is a major key to improvement for the rest of the year; this is the other one. With the way our defense has been performing, as long as Pryor can limit the dumb decisions and eliminate turnovers, our team will win every game on the schedule for the rest of the year. Last week I put some pretty unrealistic numbers up (75% completions) for what I wanted to see out of Pryor, this week I will make my test of improvement much easier to pass. I want to see Pryor make less than 3 stupid decisions and a maximum one turnover. If we continue to see some of the mistakes that Pryor made last week with the ball, we may be in trouble in Happy Valley. Make Juice Williams one dimensional – In the game that shall not be mentioned from 2007, Illinois had their way on the ground and the Buckeye defense was absolutely unable to stop them. This year Ohio State needs to stop the run game at all costs, and I think we will. TheOzone.net has had some nice articles about how the ’07 game is still on the players minds and that stopping the run and Juice Williams in particular will be a focus. When the Buckeyes stop the Illini ground attack, Juice will be forced to show what a terrible passer he is, turnovers will ensue, and sweet, sweet revenge will be at hand. Get it? It's a Juice-squeezer! Juice Williams accounts for less than 200 yards of offense - If we can do this, especially if he accounts for less than 50 on the ground, this game is in the bag. We all know Juice is the beginning and end of the Illini offense, after all. At least 4 sacks from our D-Line – We all know they’re capable of it. The only reason they didn’t record 10 against Opelt was because he kept throwing the ball every time a Buckeye defender even sniffed the backfield. Juice Williams should be much more confident in himself, and therefore and much more inviting target. The Broken Record: Continue to throw to the TE’s and RB’s - With our running game so suspect of late, this becomes even more important. The defense has to be worried about those RBs, and the only way that happens right now is if they’re a receiving threat. Bonus: The Game – I’ll be celebrating Durga Puja (http://en.wikipedia.org/wiki/Durga_Puja) with my girlfriend and several friends this weekend. It would be nice to catch the game in the middle of it! Our final honoree of the day, the legend himself, Cris Carter! There is nothing more that can ever be said about Carter. He was a legend while in a Buckeye uniform, and he stayed that way throughout his NFL career. 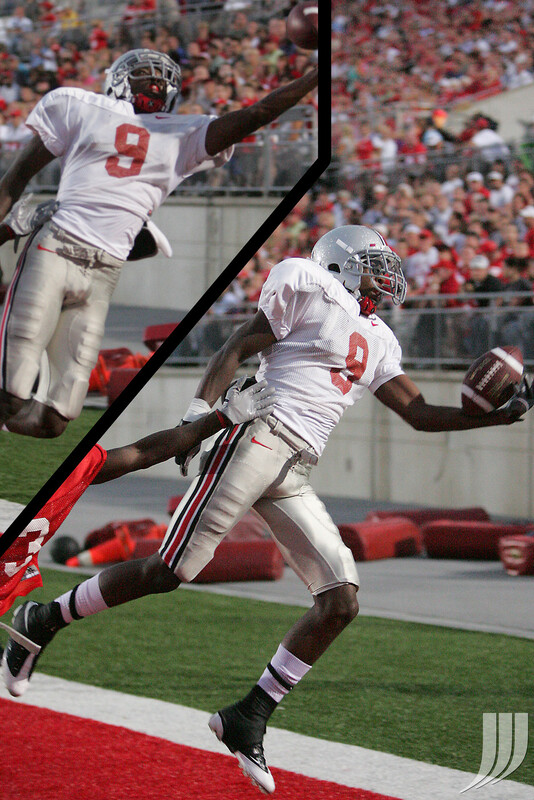 We thank him for all the amazing catches, and we honor him to this day all over Buckeye Nation. And if you ask Vico over at Our Honor Defend, he’ll show you a picture of me on ABC from the 1987 Ohio State-Michigan game, which shows me going nuts in Ann Arbor wearing a Cris Carter jersey. But this year, we’ll be thanking the entire Carter family for being loyal to Columbus. Carter’s son, Duron is a freshman WR on the team. We all can’t wait to see those magic Carter hands in action again. One additional note – Carter is on the short list for the NFL Hall Of Fame next year. If he makes it, The BBC will be hosting a party in Canton Ohio for all Buckeye fans! We promise! This post is going to be a brief look at the rest of the positions that I have not covered yet on offense. I would like to go over them more in depth, but I am running out of time. For the rest, look here. I guess I will start at the top. The QB story at Ohio State begins and ends with #2. He has recieved so much coverage over the past two years that I will keep this brief. Terrelle Pryor can run, but can he improve as a passer? If he can, things will be awesome. Even if he stays the same as a passer (all indications are that he has improved drastically) things will still be pretty sweet. Redshirt sophomore Joe Bauserman (#14) and true freshman Kenny Guiton (#13) are the backups. I don’t have much to say about them. Guiton is probably a year or two away from being ready to play and Bauserman is servicable but unspectacular. A pair and a spare, that is what to look for here. #1 Daniel ‘Boom’ Herron (redshirt sophomore) and #3 Brandon Saine (junior) are the pair looking to replace the departed Beanie Wells. Herron performed admirably in limited action last year as a redshirt freshman (89 carries, 439 yards, 6 TDs) while Saine spent last year off the radar for the most part due to injuries. Herron reminds me a lot of Antonio Pittman while Saine has great straight line speed and the ability to break tackles, but he doesn’t have much in the way of elusiveness. Herron continues the Buckeye tradition of breaking off a long touchdown run again tsun. I look for Herron to be the main guy this year, but Saine looked good in the spring and it wouldn’t be surprising if both backs saw extensive action this year. I think the two compliment each other nicely and I expect the pair to eclipse 1000 yards easily. If either does so individually it would be a mild surprise. Battling to be the spare are #4 Jaamal Berry (5’11″ 195 lbs. )and #29 Jordan Hall (5’10″ 190 lbs.) who are both true freshman. Berry has apparently been hindered by the lingering effects of off season surgery and Hall has taken advantage. I look for Hall to get more carries than Berry at the beginning of the year but both players are fully capable of contributing and provide a nice change of pace (both are very quick and elusive) in the backfield. There is a possibility that whoever loses the competition to be the third back will redshirt. Hall looks to be the 3rd back to start the year. Also worth nothing is that Hall was a teammate of Pryor’s in high school. Providing a big back look will be redshirt freshman Jermil Martin (6’0″ 227 lbs.) who wears #41. Martin moved to RB from fullback following Carlos Hyde’s failure to qualify academically. He may get some looks in short yardage or goal line situations, but I don’t think he will get many carries when it is all said and done. I think that the RBs will be a pleasant surprise this year for those expecting a significant drop off following the departure of Beanie to the NFL, especially if the O-Line improves. It should be fun to see who steps up and performs on Saturday. Fullback will be manned by a duo of true freshman younger brothers this year. 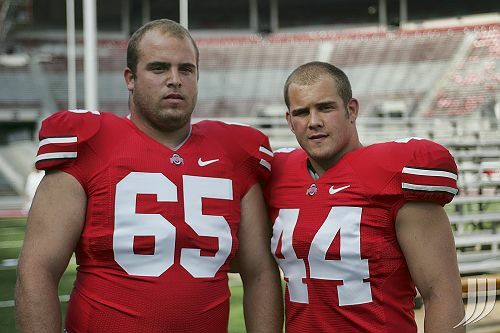 #44 Zach Boren is the younger brother of Justin Boren and #49 Adam Homan is the younger brother of Ross Homan. I don’t think that OSU will utilize the fullbacks very much this year, but Tressel called the younger Boren his surprise player of fall camp and he is listed as the starter at FB going into the Navy game. At 6’1″ and 255 pounds it should be fun to watch him smash people lead blocking. #8 DeVier Posy (6’3″ 205 lbs. sophomore) and #12 Dane Sanzenbacher (5’11″ 175 lbs. junior) are the starters, which is what everyone expected. Sanzenbacher is a slot guy in the mold of Anthony Gonzales and is the leading returner at receiver (21 catches, 272 yards, 1 TD). He has good hands and isn’t afraid to go across the middle, but he isn’t exactly a game breaker. Posey has great size and ability, but didn’t show very much last year (11 catches, 117 yards, 1 TD). He can be a great one, but I will wait and see before I label him as such. Listed as the backups are #9 Duron Carter (6’2″ 190 lbs. freshman, which are extremely outdated numbers) and #5 Taurian Washington (6’2″ 179 lbs. junior). First of all, good for Taurian Washington , I hope he is able to make a splash during an actual game this year after looking like a top reciever in each of the last two spring games. Second of all, Duron Carter, WOW. He is quickly becoming one of the players that I am the most excited about watching this year. Carter has excelent size and superb hands and has impressed everyone in the off season and during fall camp. It looks like Carter might be a big time contributor right away. I look for Posey, Sanzenbacher, Washington and Carter to be the starters in four reciever sets, with #82 Ray Small (5’11″ 180 lbs. senior) being a wild card. It doesn’t look like Small is out of the doghouse yet following some off season academic issues, but I would be surprised if he doesn’t get significant reps by the end of the season (barring further off the field issues). I don’t want to make any predictions about the productivity of our recivers this year, as that depends a lot on how well Pryor and the offensive line perform, but the Buckeyes have plenty of players that are capable of replacing the Brians (Hartline and Robiskie) from the 2008 team, and the depth may even be improved. There has been a lot of talk about using the tight ends more in the offense this year, which happens every off season. I will believe it when I see it. The starter is #86 Jake Ballard, who is big (6’6″ 256 lbs.) and has good hands. Ballard will be a steady presence at TE this year. Show it off while you can big guy. #11 Jake Stoneburner (6’5″ 230 lbs. redshirt freshman) is listed as the backup at TE and is a converted WR who could present some serious matchup problems for defenses. Will OSU take advantage of said matchup problems? Once again I’ll believe it when I see it. If the offense looks to the TEs as much as in the past (11 catches for tight ends last year), take conselation in the fact that Ballard is a good blocker. Also worth noting is that #92 Todd Denlinger (6’2″ 292 lbs. 5th year senior) is seeing time at TE during short yardage situations for some added muscle in the mix. That does it for my look at the offensive skill positions. In summation, the Buckeyes are young, inexperienced, but very talented on offense. I will try to have a post up before the end of the week on the DBs.